Headquartered in San Diego, California with an R&D center in Chengdu, China, AgigA Tech began development of NVDIMM technology in early 2007 under Simtek, a market leader in non-volatile SRAM (nvSRAM) ICs. 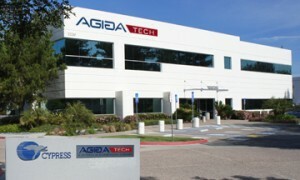 AgigA Tech became a subsidiary of Cypress Semiconductor (Nasdaq: CY) through the Cypress acquisition of Simtek in September 2008. AgigA Tech began as “Project Innovation” under Simtek, with the goal to develop a next generation memory solution to meet the the need for higher-performance, higher-density non-volatile memory. Our patented approach couples innovations in battery-free power management, high-speed data movement and systems knowledge, while leveraging high volume readily available memory technologies to provide a unique non-volatile solution scalable to very high densities. AgigA Tech has also been instrumental in the standardization of this technology into what the industry now recognizes as NVDIMMs, a new product category adopted by the world’s leading OEMs of server and storage platforms. AgigA Tech’s products are available worldwide through Cypress’s network of franchised distributors.